As a boy, I would regularly altar serve at the Way of the Cross at my home parish. 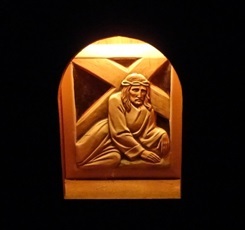 There was something that deeply struck me about its solemnity, as I looked upon the dramatically life-like expressions on the face of Jesus, his friends and his foes on the wood-carved stations that hung on the church walls. As a penance (and as upper-body exercise), I would even try to hold our parish’s wood-and-brass processional cross up for the entire time, without resting it on the ground. For a while, as I began advanced study of theology, the Way of the Cross somewhat lost its aura of mystique for me. With increased knowledge of historical criticism, I could question the historicity of certain stations, and the late 19th or early 20th century devotional idiom in which many of its popular versions are composed began to seem dated and pietistic. While the pre-critical consciousness of childhood can’t be regained, I feel that I’ve come to a renewed appreciation of why this Lenten devotional practice remains vitally important: because it dramatically represents what Lent and indeed the entire Christian life is about. The Way of the Cross is the way of life, because on this earth suffering is encountered more often than the consolation, the sweetness and the amenity of grace. All love that does not take its origin from the Savior’s passion is foolish and perilous. Unhappy is death without the Savior’s love; unhappy is love without the Savior’s death. Love and death are so mingled in the Savior’s passion that we cannot have one in our hearts without the other. Upon Calvary we cannot have life without love, or love without the Redeemer’s death. Except there, all there is eternal death or eternal love. All Christian wisdom consists in choosing rightly. Such talk of the prevalence of suffering, the mixing of death and love, of either/or choosing, may feel contrary to the optimism so characteristic of our Salesian tradition; it may seem morbid or even fatalistic. But it’s not. Meditation on the Way of the Cross is not meant to lead to the self-flagellating kind of moroseness that Francis de Sales condemned, but to a deeper sense of hope and indeed joy. We have a sometimes painful awareness that we live lives, and live in a world, that need redeeming, but we more fervently rejoice in the fact that we do indeed have a Redeemer. Much happens in our lives and our world that often seems arbitrary, unjust, or meaningless. Out of nowhere, a family member gets diagnosed with a terminal illness. The same model of plane you rode one day falls out of the sky in another continent the next. Someone you look up to and admire turns out to have been living behind a façade. The instinctive reaction when faced with the tragedy that often seems to strike without rhyme or reason is to want to run away and hide. Which is precisely what a group of misfit Galileans did when their best friend was feted out in royal fashion on a visit to the big city on one day and then publicly executed in that same city a few days later. We will recall that you come to us also in our sorrowful journey. We will not forget that you are with each soul that suffers. We will remember that you are very close to us, and that you look upon us. This look which you cast in our direction will encourage us in our trials. It is this knowledge that Jesus has taken upon himself the pain, the confusion, the sins of the world, that Jesus is with us when we feel hurt, confused, angry, and has definitively, through his Resurrection, given God’s response: “strong as death is love, relentless as the nether world is devotion” (Song of Songs 8:6). It’s this knowledge that’s the source of true joy. It’s because of this that one of the greatest principles of the Christian life [is] to know how to rejoice in time of sorrow. (Brisson, “Laetare Sunday, Cor Ad Cor, March 21). Whenever we bear our crosses, Christ is the one bearing the weight with us; Christ makes this cross holy and through it redeems us and our world. Older PostWe are so lucky Mary never held a grudge!